The journal is published quarterly every year in last week of March, June, September and December from Raipur, India. The journal is indexed/listed with Google Scholar, Indian Citetion Index, PSOAR. The Editor of the journal ‘Asian Journal of Research in Pharmaceutical Sciences (AJPSci)’ do not necessarily agree with the views expressed in the matter published herein. The Editor does not claim any responsibility, liability for statements made and opinions expressed by authors. The information and opinions presented in the Journal reflect the views of the authors and not of the Journal or its Editorial Board or the Publisher. 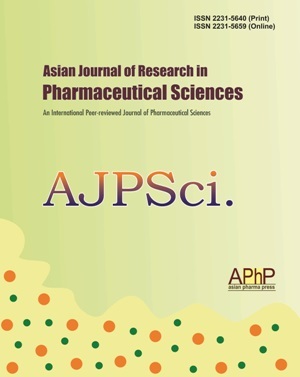 The Asian Journal of Research in Pharmaceutical Sciences (AJPSci) nor its publishers nor anyone else involved in creating, producing or delivering the materials contained therein, assumes any liability or responsibility for the accuracy, completeness, or usefulness of any information provided in the Asian Journal of Research in Pharmaceutical Sciences (AJPSci), nor shall they be liable for any direct, indirect, incidental, special, consequential or punitive damages arising out of the use of the Asian Journal of Research in Pharmaceutical Sciences (AJPSci).